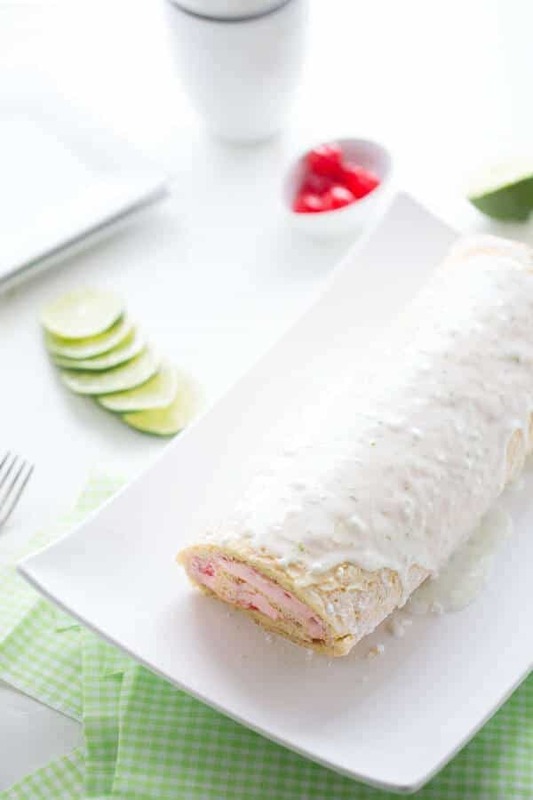 A vanilla cake roll filled with a sweet cherry buttercream and topped with a tart lime glaze! Cake rolls remind me of my mom. I have fond memories of her jelly rolls and swiss cake rolls. It was a good day when I found those cakes in the kitchen. Knowing my mom, she probably gave up her share of the cake so that one of us girls could have more. That’s what mom’s do. I have learned that being a mom does not mean you feed your children, although you certainly spend an inordinate amount of time worrying about your children’s nutritional needs. Being a mom does not mean you cloth your children, although providing clothing and then arguing about said clothing is a big part of motherhood. Being a mom does not mean providing shelter for your children, although you will make the coziest spaces possible for your little ones. To me being mom means you will always deny yourself the last piece of cake or pizza because you want your kids to be sated and happy. It means you will forgo your girl’s night out because you don’t ever want to miss your son’s at bat. Being a mom means you will drive all over the state for gymnastics competitions. Being a mom means you’ll spend a ridiculous amount of time creating a Lego cake for the perfect birthday party. Being a mom means you will get over your own shyness so you can arrange playdates with other moms. Being a mom means you will confront any child (or adult) who isn’t playing fair. Being a mom means you will rock and soothe your baby in the middle of the night even though you are on the verge of pure exhaustion. Being a mom means you will hold your little girl tight when she has scary dreams. Being a mom means you will lay on the floor next to your sick child just in case they need a bucket. Being a mom means you are insanely loyal, fiercely protective, and shamelessly proud. Being a mom is the one job from which you will never retire. It is the only job that doesn’t provide a salary or retirement plan but pays in countless dividends, hugs and kisses. Being a mother means you will always be rich in love. 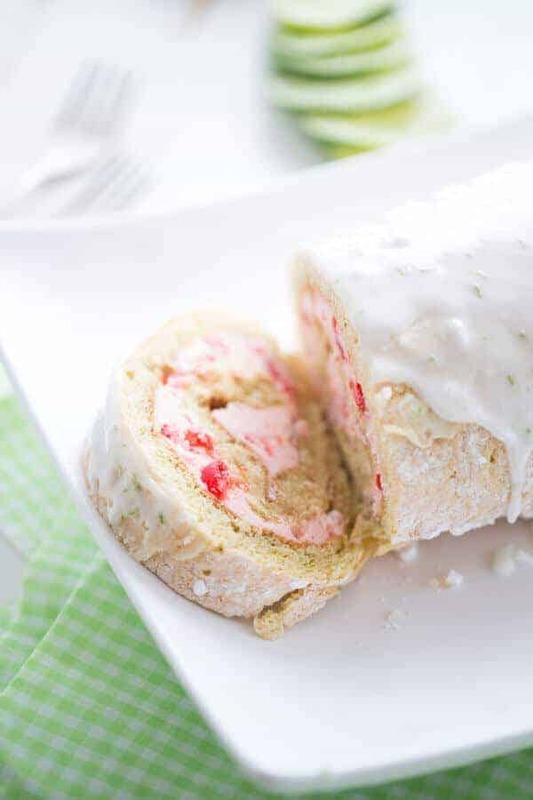 This Mother’s Day I will be sharing this cake roll with my mom. While it’s not the kind of cake roll she may be used to, I think she’ll enjoy it nonetheless. But you do not have to be a mom to enjoy this cake! Anyone will love it! The cake is tender with a hint of lime while the filling is creamy, sweet and balanced by the tart, lime glaze. 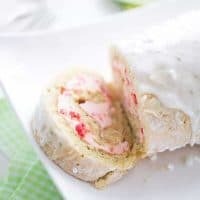 This cake roll will become a very requested recipe! 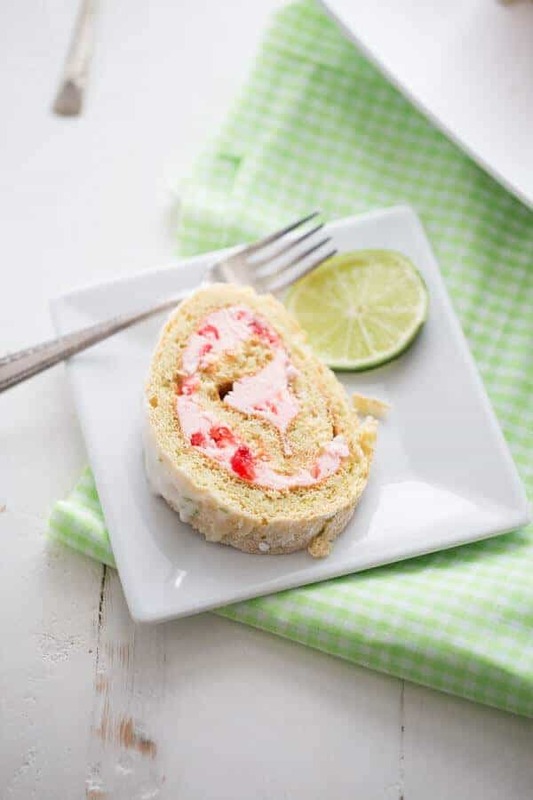 Lime cake roll with a sweet cherry filling a tart lime glaze. Preheat oven to 375. Spray a jelly roll pan with nonstick spray. Top pan with parchment paper and spray paper with non stick spray. Set pan aside. In a bowl, whisk egg yolks until thick and golden in color. Gradually add in 1/3 cup of sugar, lime juice and lime zest. In the bowl of a mixer, beat egg whites with the whisk attachment until semi soft peaks begin to form. Gradually whisk in 1/3 cup of the remaining sugar and continue beating until stiff peaks finally form. Remove and carefully fold in yolk mixture. Pour batter into prepared pan. Bake cake for 12 minutes or until cake gently springs back when touched. After removing cake from the oven, and immediately sprinkle with powdered sugar. Carefully turn cake out onto a clean towel that has been dusted with powdered sugar. Remove parchment paper. Roll cake with towel, starting with short end. Let cake cool completely. While cake is cooling prepare the filling. In the bowl of a mixer cream butter until light and fluffy. Slowly beat in powdered sugar one cup at a time. Add maraschino juice, heavy cream and salt. Mix just until buttercream is smooth. You may need to add in more liquid if buttercream is not smooth and creamy enough to spread. Fold in chopped cherries. Slowly unroll cake. Spread cherry buttercream over the entire cake. Carefully reroll cake and place on a serving plate, seam side down. Trim ends if desired. 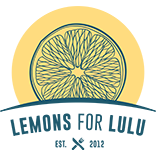 In a small bowl, whisk together powdered sugar, lime zest and lime juice. Slowly pour glaze onto cake. Let set completely before serving. Be sure to beat your egg white until thick and glossy. You’ll know when they are ready by lifting your whisk out of the bowl. If your egg whites rise up straight and do not fold over, they are ready. Batter will be thick. It will look too thin to spread. Do your best to cover the jelly roll pan. The cake will be thin when it comes out of the oven. It is best to roll your cake when it is still warm. If the cake begins to cool it will crack when it is rolled. The filling is sweet. You may have to add more juice or cream than what is listed in the ingredients. You will have to judge how creamy you like your filling. I placed the cake in the refrigerator after drizzling on the icing. I wanted to be sure it was completely set before serving. I adore this post. It really makes me think about the sacrifices my mother made. Seriously she gave it all for me. And this cake also reminds me of the cakes my mom used to make. Beautiful! Looks gorgeous! And the flavors sound really good! I begrudgingly left the last cookie on the plate yesterday so Jordan could have it. It was hard, but I did it. I’m winning at motherhood. 😉 LOVE THIS CAKE! 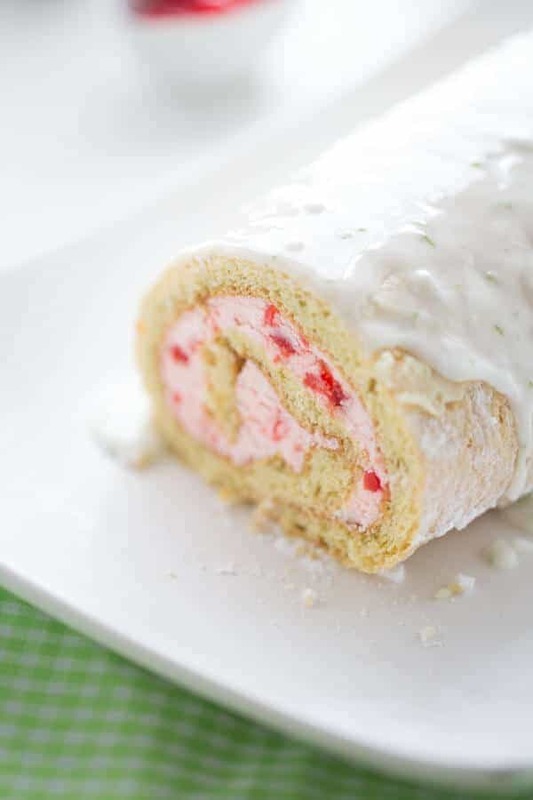 This cake roll is perfect! I love the combination of cherry and lime! Awww. This post is too much, I feel like crying while reading everything about mother’s job. I agree with you, motherhood is the hardest and happiest job, one can apply for. Oh by the way, your cake is just adorable! Thank you Lea, for always commenting and reading! I truly appreciate it! You have such a lovely post. I adore this so much. You explained properly the sacrifices that mothers do for their children. Motherhood is really the toughest job in the world. And the cake looks really amazing! It is such hard job, but I wouldn’t trade it for the world! What size jelly pan do you use? 10×15 or 12×16? Michelle, I used a 10 x 15.